Lemon Harangue Pie: "Does this uniform make me look fat?" Sure, they're trained to kill, but that doesn't mean women in the military don't want to look fabulous. According to Military.com, Georgia's Ft. Benning is trying out a new Army Combat Uniform for women. Capt. Patricia Cameron is liking the new uniform and the compliments she's been getting. "People keep asking me: 'Did you do something different? Did you lose some weight?' ... Before I was feeling kind of frumpy in my uniform, whereas now I feel like I look like a professional." 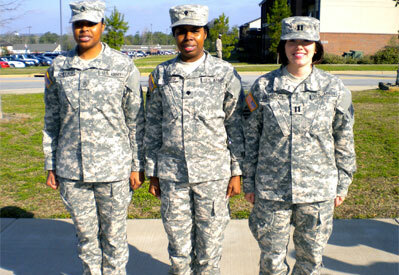 Cameron is one of about 150 female soldiers selected to try out the uniform for three months. The new uniform has incorporated all sorts of changes aimed at giving women more room in those areas where it's needed. The response so far has been very positive. Just ask Sgt. Shakeisha Cheeks. She thinks the new elastic waistband "makes all the difference." But, alas, that elastic waistband will have to wait. In keeping with bureaucratic military tradition, a new female uniform won't be made standard issue until 2014. Sadly, I cannot help but see a more serious side to this story. My biggest problem is the inherent implication of the term "Army Combat Uniform for women." Perhaps that's just my chivalrous side coming out, but the Pentagon's Military Leadership Diversity Commission has already recommended "that ground combat units be open to female troops, arguing women are already engaged in combat and that keeping them out of operational career fields puts them at a disadvantage when it comes to promotion." Apparently, our nation has moved beyond the "Do we dare send women into combat?" stage and into the "We want our sisters, daughters, wives, and mothers to feel comfortable and look good when we send them off to die" stage. Kind of a sad commentary, if you ask me.